The results of our ‘show of hands’ on the Capitol Hill light rail station jet art are in — and things aren’t any more clear. You can see the summary of results for yourself here. 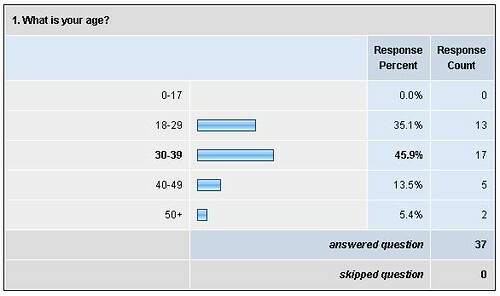 Usual caveats apply — foremost, all respondents chose to participate so there is bias from the outset. The bias, however, seemed to be equal on both sides. 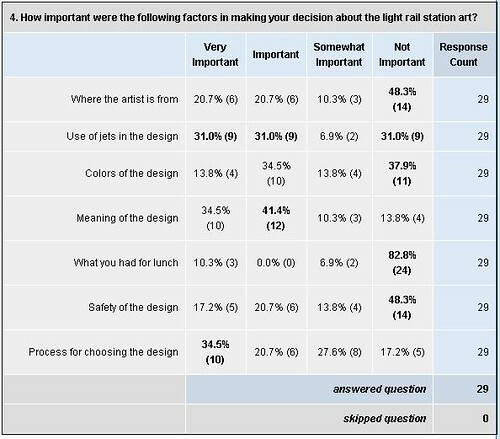 While the majority of the 66 respondents supported the jet art design, the results were a statistical dead heat. On this, we are a people evenly divided. Though you might expect one crowd to skew younger than the other, there was also very little statistical difference between the Yes and the No voters in terms of age. 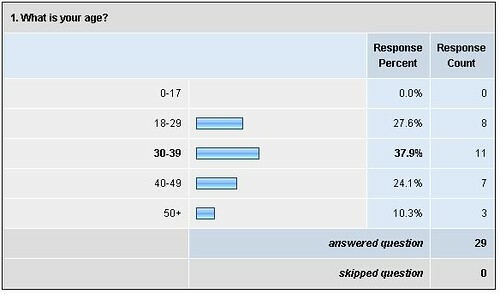 The Yes crowd skewed slightly younger but enough to count when it comes to extrapolating across the rest of the Hill. We also asked people what was important to them in making their decision about the art. 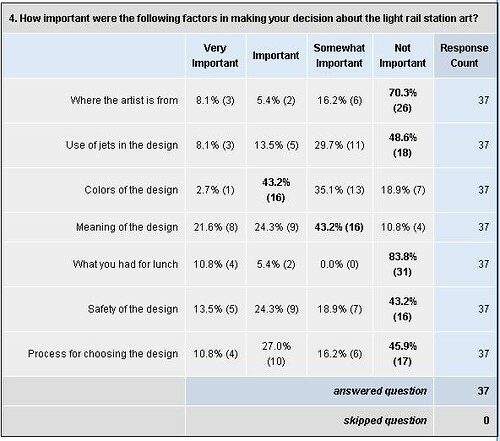 You can see for the Yes respondents, where the artist is from and the presence of jets were least important while meaning and color were most important. For the No crowd, they also cared a lot about meaning but process for selecting the design was also high on the list. The No folks also had less of a sense of humor (see the lunch item) but the joke also wasn’t that funny. So there you have it. We also have ZIP code information reported by each person who took the survey but that will take more time to report on. Won’t be surprised to find out it also presents even splits. In the end, the biggest takeaway is that the Hill is evenly divided on this and the reason, more than any other, is what the design means and how it was selected. It’s a frustrating lesson — the meaning issue would be there no matter what. But in this era of information flow, the process breakdown is nothing but frustrating. If you are interested in helping break through this breakdown, attend next Thursday’s Capitol Hill Community Council. Barbara Luecke, Start Program Manager & Jeff Munnoch, Link outreach, will be presenting on latest status of the designs after the recent public forum. given the results are pretty split!